This wasn’t sold in stores. It was not available for purchase anywhere. This is because my daddy built this Hollywood Square frame just for me! Before I was old enough to go to school, I would watch The Hollywood Squares on daytime TV with my mom and grandma. I had seen it enough times to start “playing Hollywood Squares”. I would line up my stuffed animals on the steps; the first step was the bottom row, the second step the middle and so on. I apparently had so much fun with this that my dad built me this frame. To this day, I look at the picture and I know who certain toys represent. The clown in the middle is Paul Lynde. The duck on the bottom left is Charlie Weaver. Next to him, the blue baby, is Pearl Bailey. Next to her, the stuffed bear, is George Gobel. I swear to you that I hardly know what these Hollywood people did in show business, nor do I remember what they looked like. But when I see this photo, I know Charlie Weaver is a duck and the elephant in the top middle row is Rose Marie. Next to her to the left is Humpty Dumpty. I couldn’t remember his Hollywood Squares alias, but I knew he was a fat man with black curly hair. After research, I saw that he was Marty Allen. Note the three little people on the floor. 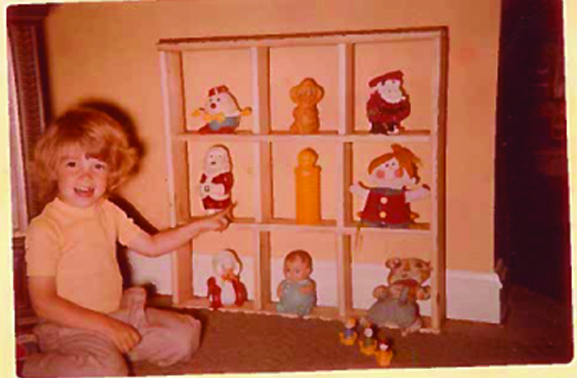 These are Fisher Price people. The host of Hollywood Squares is in the middle, the contestants on either side. Now this game wasn’t just about mimicking what they did on the TV show. I had a plastic gun that shot plastic balls. After I finished playing “The Hollywood Squares story” (whatever that was), the stuffed celebrities then became objects in a shooting gallery!